Who would have ever thought that Ron Grun and Roger Lebow would return to the Venice Beach Boardwalk 38 years later and play together again? From ½ way around the world, Ron living and playing in Paris France and Roger Lebow living, playing and teaching in Pasadena California, would perform again where they met originally on the Boardwalk. The first historical image of them was recorded in 1975 rvmann.com/artwork/2555394_Symphonic_Bo? and featured in a photographic book about the Venice Boardwalk, "North Beach 90291" circa 1983 and this second image was recorded 8/23/2013. 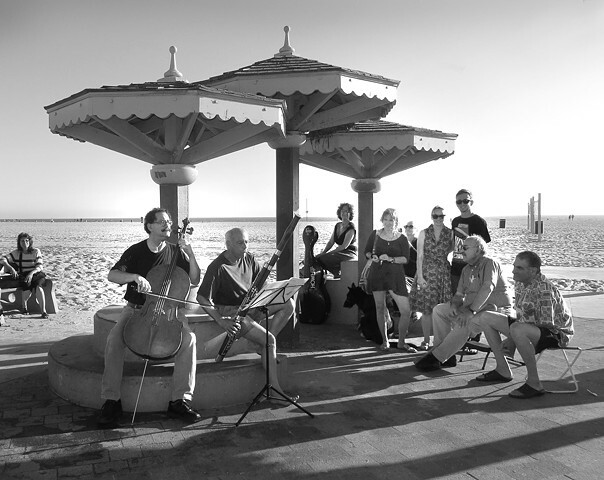 The Venice Boardwalk is alive "With the sounds of Beethoven"
They developed an old friendship, which has bonded them through the years on mutual grounds with..."The Passion For Music."